Becoming a mom to two is a big change. Planning for this change I felt like baby wearing would be a great way to keep up with both boys. I am pretty new to baby wearing. With Jayden I had planned to baby wear, but didn't have good carriers or the know how on how to do it well. I was discouraged. But this time around I am determined to baby wear Evan with hopes of it making life a little easier. So getting started I need to find a carrier that is easy to use and good for infants. Baby K'Tan was kind enough to send me one of their carriers for review. The Baby K'Tan carrier is super easy with no wrapping. 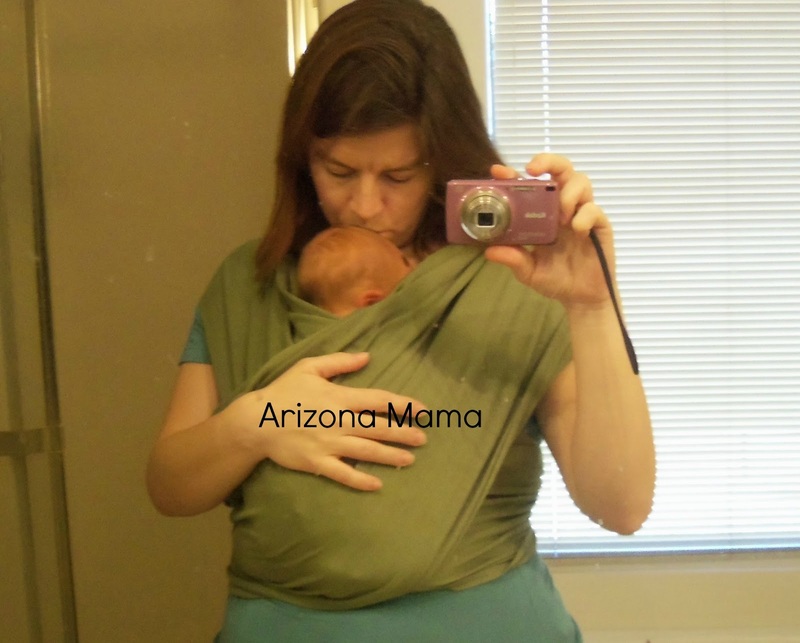 It is the easiest wrap type carrier I have seen. It looks like a wrap, but doesn't need any wrapping. This is great for a newbie like me. The wrapping kind of scares me, I'm worried about not getting it right and baby falling with a regular wrap. The Baby K'Tan is made of two loops of cotton material which are connected by a third smaller loop called the back support band. So essentially it is a wrap already made up. The carrier can be used in multiple carry positions by babies 8lbs to 35lbs. With 6 different carry positions you are sure to find at least one or two that work for you. I received the Baby K'Tan in size small sage green. The carrier comes with a free carry pouch making it nice to store when not using it. I took a little time to look over the instructions on how to use the carrier. 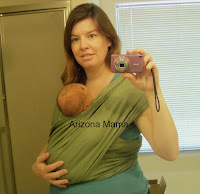 I wanted to start with the Kangaroo carry, best for newborns up to 3 months of age. So since we had a doctor appointment for Evan 2 days after leaving the hospital I decided to try the Baby K'tan. I put it on and held baby Evan gently as I put him in. I had the instructions out to try follow along. I think I did it right and he was snug and it worked well at home so we tried it out. I actually kept the carrier on as we drove to the doctor and I put it on as I took him out of the car at the doctor's office. I was able to sign in, find my insurance card, and fill out paperwork for the doctor all while holding Evan in the carrier. He actually fell asleep soon after I put him in. He was happy and content and I fell like he was safe and secure. It left my hands free to do other things. Now, I am new to this so of course I often put my hands around him to support "just in case", but didn't really need it. After the appointment I put him back in the carrier.. upset and crying. But he soon calmed down and was fine to get in the car. I think the carrier helped him to calm down and sleep. I love that! I now keep this carrier in my car so whenever we are out and about I use it to carry Evan. I have used it at the grocery store, amusement park, doctor appointments, and many other places and find it really easy to use. Baby K'Tan comes in many different colors including organic. You can find it in size XS-XL. Thank you to Baby K'Tan for sponsoring this review.